"Tenchu 2: Birth of the Stealth Assassins is a prequel to the popular Tenchu: Stealth Assassins. It is a stealth game, produced by Massami Yamamoto, and directed by Takuma Endo, both of whom worked in their respective roles on Tenchu: Stealth Assassins. Both games were developed by Acquire and published by Activision, and appeared on the PlayStation. 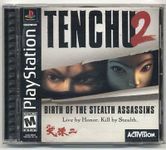 Source: Wikipedia, "Tenchu_2:_Birth_of_the_Stealth_Assassins," available under the CC-BY-SA License.